Wet Cat Food Vs. Dry Cat Food – What’s Best? You go inside a pet supply store or along the aisle of pet foods and a thousand choices cloud your brain. What flavor do I get? What brand of cat food is the best? But the most pondered question probably is, should I get wet or dry food for cats? As a cat owner, you would always want the best for your babies. It can be a bit complicated as you will see many variations for every cat owners. Some are dry food purists while others may argue that this is not generally good for felines. There are many influences surrounding cat food including your feline preferences. A high-quality or premium labeled brand is not necessarily the best for your cats. The main thing to know about is what is inside their food and if it is sufficient to supply the nutritional needs of your pet. In order to make a decision, you have to know the essentials concerning cat nutrition. Cats have a different nutritional requirement than dogs. The fact that cats are obligate carnivores means that meat is needed in their systems. They need to have a high protein diet given their nature. Their bodies do not have the ability to generally digest plant-based matters. It is also important to note that cats have a low thirst drive that may have come from their ancestors who thrived in the desert. The evolution of cats revolved around getting their water requirement thru consumption of food. As mentioned above, a diet of animal protein is best suited to cats’ digestive system. This is where they get their energy through the process of gluconeogenesis. Aside from energy, the amino acids present in proteins are important to feline’s health. They contribute to the maintenance of muscles, ligaments, and enzymes in the body, much like in humans and dogs. Amino acids are the building blocks of protein. There are amino acids that are biologically important and can be synthesized inside a cat’s body. However some need to be provided from the outside. These are called essential amino acids. Cats are not able to synthesize 11 of the 20 needed amino acids in their body. If your cat is deficient in any of the essential amino acids, it may cause serious health problems. Let’s take arginine and taurine as an example. Arginine is an essential amino acid that is directly involved in the removal of ammonia in the body. Arginine deficiency may cause hyperammonemia or ammonia toxicity in the body. Symptoms include vomiting, muscular spasms, and drooling. This may lead to severe brain diseases resulting in death. Taurine has been found as an essential amino acid that plays a critical role in the growth of cats during the 1980s. Since then it has been added as a supplement to all manufactured cat food. Taurine deficiency causes vision impairment, heart weakening, low immune response, poor neonatal growth, and other metabolic problems. The essential amino acids can be found naturally in high-quality proteins. This is a good enough reminder that cats are not meant for vegetarian diets. Another source of energy, the fats provide the most concentrated form of energy for cats. They have twice the energy provided by protein and carbohydrates. Fats are usually given in the form of animal fats or seed oils from different plants such as sunflower oil. Added fats supply the essential fatty acids that cats are not able to synthesize in their systems. Fatty acids are responsible for cellular functions in the body. A cat found to be fat-deficient will exhibit the following symptoms: dandruff, stunted growth, listlessness and infection susceptibility, and impaired learning ability. The right amount of fat in the diet will also contribute to your cat’s coat and skin to be healthy. There is no required maximum fat to be ingested by a cat. Studies have also shown that there are no harmful effects even if they eat more than what one cat food contains. The minimum required fat for cats is 9% of dry matter based on the National Research Council from the National Academies of Sciences, Engineering, and Medicine. Examples of essential fatty acids are Omega-3 and Omega-6 which are primarily involved in the physiological system of their body. Sources of these two fats usually come from fish oil, chicken oil, and even canola oil. What’s more, fats give your cat food texture and make it tastier. Just like in humans, vitamins are essential to regulate organ development and foster immunity. There are two types: the fat-soluble and the water-soluble vitamins. The fat-soluble vitamins (Vitamins A, D, E, and K) can be stored in fat cells so it may cause light toxicity at high dosages. This is the difference between water-soluble vitamins which are released thru urine so it must be supplemented frequently. You’ll be able to see a complete list of the recommended daily allowances for vitamins with their corresponding functions in the released guide about Your Cat’s Nutritional Needs. A similar thing happens when there is deficiency or excess of these said minerals in the cats’ body. An excess of iodine in their body may cause nasal discharge, dandruff, or even worse enlargement of the thyroid glands. Water is very important in all the bodily functions in cats’ body. As mentioned earlier, they consume their water requirement thru ingestion of their food. The food described here usually contains 65% – 80% water. It is important that this level should be included in a cat’s diet to avoid dehydration. There are many common health problems related to a cat’s diet heavily involving an excess or deficiency of the above nutritional needs. Typical diseases include diabetes, cystitis or kidney disease, obesity, hepatic lipidosis, urinary tract infection, dental diseases, and many others. A general knowledge of your cat’s nutrition can be a good guide to maintain your pet’s health. What is in a Wet Cat Food? Wet cat food as you very well know is mainly composed of protein from meat, water, and several thickening agents to hold it together. Some brands add vitamin and mineral supplements as well. Wet cat food usually comes in cans or pouches. The use of preservatives is usually limited or even nothing at all in wet food. Wet food undergoes the addition of meat or forming of meat chunks. The meat chunks are usually composed of meat and meat by-products. It is usually made into finer ground meat and is emulsified with binders to make it look like whole meat. The addition of the gravy solution is next, where the thickening agents and flavorings are added to provide texture and taste. The meat is added into the gravy and cooked slowly under low heat. Once it reaches the right temperature, it is then packed into either pouches or cans. The last step would be the sterilization part that kills all possible bacteria that may spoil the food. Wet food is more prone to spoilage due to its high moisture content. Its difference with dry food is that it is sterilized after packing so the use of preservatives is not needed. Most canned wet foods have a shelf life of 2 years unopened. Wet cat food is more expensive as compared to dry food. It may range from $0.55 up to $1.40 each for a 3-ounce can. The prices are dictated by the amount and type of meat used in each brand. It’s usually the brands that use whole meat in their line that have the highest value in the market. This type of cat food is advantageous in terms of its high water content and its protein that ensures cats get the nutrition they need. Another thing is that it comes in small sizes so you may have more variety and portion feeding control is easily managed. What Goes Into a Dry Cat Food? 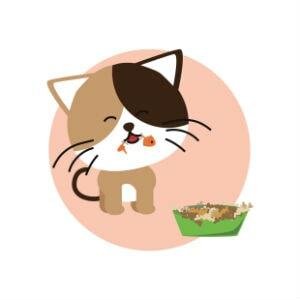 Dry cat food usually comes in kibbles in different shapes and has a typical 8% – 10% moisture content. It is usually packed in re-sealable bags since it is not susceptible to deterioration and mold infestation. You’ll be sure to see loads of dry food brands that come in different sizes and marketing labels such as organic, natural, or premium. The meat and the other ingredients go thru the extrusion process to produce the kibbles. A dough-like mixture is initially made then put into a high-pressure machine and shaped into various sizes. It is then cooked and passed through a dryer to remove the water. The last process would be the spraying of fats, oils, and vitamin supplements before packing and sealing. The dough is a combination of wet and dry ingredients. Other ingredients include grains, cereals, and the antioxidants. Synthetic taurine and other vitamins are typically sprayed together at the end due to their vulnerability to heat and pressure. The oils are added as fat enhancers that require the use of antioxidants. The antioxidants used typically are BHA (Butylated hydroxyanisole) and BHT (butylated hydroxytoluene). The use of these antioxidants is regulated by certifying bodies such as the FDA and AAFCO. Some manufacturers prefer to use natural herb extracts such as rosemary as a substitute to the synthetic ones. A dry food is packed with carbohydrates with the use of cereals and grains and consequently has a lower protein content than wet cat food. Please take into consideration that a cat’s recommended intake of carbohydrates should be lower than 10% on a dry matter basis. Any more than this and your cat is prone to obesity, therefore, increasing the risk of diabetes. Given the low moisture content, feeding of dry food should be always accompanied by fresh water. You may try using water fountains to lure the cats to drink more. It was also said that eating dry cat food will lessen the risk for dental diseases. You will also be able to see dry food specially formulated to improve oral health. Dry cat food is shelf stable and is cheaper compared to wet food. It is also more convenient for pet owners who are usually not home and engage in free feeding. You can leave dry food out in the open for hours compared to wet food that should be left out only within 30 – 60 minutes to prevent microbial growth. Price range for dry cat food can be from $12 to $20 for a 14-lb bag. It may go higher depending on the added supplements or dietary functions it may offer. The same with the wet food; if it uses whole meat as a base, then you have to expect the price to be high. A good balance between the two types would be a good resolution to provide your cat’s complete nutrition needs. It is good to take advantage of the pros that we can take from both types. The best food choice is dependent on weighing the pros and cons. You may want to have a routine where you give out dry food in the morning and wet food at night, especially for busy people. At the very least, you’ll be able to monitor the wet food portions. Cat owners will agree that cats are quite the picky eaters so it would be good to observe what their preferences are and adjust accordingly. Veterinarians will also sometimes prescribe your cat to a specific diet especially if there are health problems. A sudden shift in a cat’s diet will be tricky and would require that you gradually introduce the new food. This is also applicable to diet transitions from dry to wet or vice-versa. Balancing of a cat’s diet includes the control of food intake or portion control. Consider the energy requirement of cats too, as some are more active than others. It is also important to select a food labeled to a cat’s life stage and condition. Pet food manufacturers specifically formulate it according to a cat’s needs. The recognized life stages of a cat are lactation/gestation (pregnancy and nursing), growth, maintenance, and all life stages. You may know more about what is inside a pet food and how it is safeguarded by the Association of American Feed Control Officials. It is better to check if the cat food brand has a seal of AAFCO to ensure that ingredients and other additives are within cat health standards. It is of more value to know what your cat gets from the food. Always remember to check the nutrient labels included in every packaging. It is important that they get the right and sufficient nutrients rather than being influenced by marketing labels. Therefore, it is a good weapon to know how to read pet food labels. A standard pet food label consists of the product name, net weight, ingredient list, nutritional content or guaranteed analysis, feeding directions, manufacturer’s name, and production or expiry date. As mentioned, you should select the right food according to a cat’s life stages. It should state that a particular brand is designed for kittens, adult, seniors, or for those that have allergies. It should be clearly stated on the front label. Another important thing is the ingredient list and it is stated by law that ingredients should be written in the decreasing order of weight in the product. This includes the water content of the ingredient. If you check the first three ingredients and meat is the first on the list, then you know that it contains high in protein compared to others. Protein source may come in different forms on the list like meat, meat meal, meat by-products, and others. Meat by definition is the actual flesh or muscle tissue of the animal such as beef or lamb. It may also include heart and lungs as they are considered a muscle tissue. The source is a raw product.Meat meal, on the other hand, is a processed meat product that is cooked using high pressure so it preserves the proteins and minerals. It is a high protein content product. The use of this ingredient, however, gives the manufacturers a choice to either state its origin or not; though some brands list their sources as “beef meal” or “lamb meal.” The meat by-product term includes the muscle tissues, other internal organs, and bones. There’s a 95% rule that states that if a label says “Tuna Cat Food” for example, the product should have at least 95% tuna in the ingredients excluding the water. If it is a combination say Chicken and Liver Cat Food, then the two main ingredients should add up to 95% of the total ingredients. The first name having the higher quantity than the second ingredient. You will also find a cat food that is labeled as dinner but it doesn’t mean that it’s a complete dinner for your cat. This is the 25% rule that the main ingredient should be at least 25% in the formulation. The terms “platter, entrée, nuggets, and formula” will probably contain only a quarter of the meat as present in the whole product. If you see a label like “Cat Food with Chicken,” it is most likely to have only at least 3% chicken in its ingredient. You may have it confused with Chicken Cat Food so be sure to read the labels. Another important thing is the Guaranteed Analysis part. This is where you will find the amount of protein, fat, carbohydrates, fiber, vitamins, and minerals a pet food contains. It is declared as either on a per recommended portion size or “as is,” meaning the total amount present in the pack. Do not compare directly the protein content of a dry food versus a wet food since the latter has high moisture content naturally. Convert them both on a dry matter basis first before comparison. This is also applicable if you’re comparing one wet food brand to another. To convert to dry matter, divide the percent guarantee by the percentage of dry matter then multiplied by 100. The term crude only refers to the test method used in evaluating a specific nutrient. If you see a brand that’s labeled “Grain-free,” it doesn’t mean that it doesn’t have any more carbohydrates in it. A source of carbohydrate may also come from potatoes or other vegetables. Again, check the ingredient list and guaranteed analysis. The terms organic and natural are not interchangeable. A pet food labeled “organic” means at least 95% of it is made up of organic ingredients. While “natural” may only mean that the product did not use any artificial colorings or flavors. These are just some common guidelines that you might notice while shopping for your cat food. You may be able to read more details about labeling in the pet food section of the US Food and Drug Administration. You should always be in consultation with a veterinarian if you will have a specific health or diet concerns for your cat. He/she should be able to help you with details and help you design a well-balanced diet for your pet in terms of its age, lifestyle, and overall condition. Communication with your veterinarian is very important.